What Do House Geckos Look Like? Look! There he goes, that little reptile scampering up your wall. Depending on where you live, you might become well acquainted with house geckos. 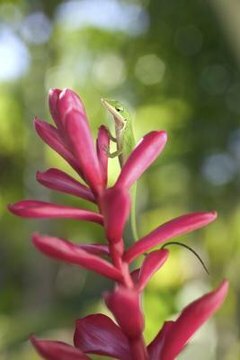 Several species of these lizards live in Florida, while the Mediterranean gecko, also a house gecko, has spread to other warm spots along the Gulf Coast and into the Southwest. The Mediterranean house gecko (Hemidactylus turcicus) has expanded his reach beyond Florida and is found as far north as Kentucky, as well as in Texas, Alabama, Florida, California and Arizona. Head to tail, he's about 4 or 5 inches long with bumpy skin and large, splayed toes. His snout is rounded and his tail is slightly flattened, tapering toward the end, and sports brown stripes. He's a light-colored reptile, looking gray or almost white, and has mottled dark patches. Florida shares with Texas the common house gecko (Hemidactylus frenatus), another small reptile averaging around 4.5 inches long head to tail. He hangs out on building walls, and he may be hard to spot because of his ashy gray or light-pink color, inlaid with an irregular, darker pattern. His belly is a creamy white. The common house gecko's not very scaly, having a mostly smooth finish. His tail tapers to the end, and his snout is elongated. Also known as the Amerafrican house gecko because of his African roots, this gecko (Hemidactylus mabouia) has taken up residence in Florida thanks to the foliage and agriculture trade. Head to tail he runs about 5 inches long, and he comes in varying colors, ranging from olive-brown to gray or tan. He has backward-pointing chevrons on his back, providing him great camouflage ability, and small, wart-like bumps on his sides. If he's on the side of a light building at night, he'll take on a light-colored appearance. The fourth house gecko found in Florida is the Indo-Pacific gecko (Hemidactylus garnotii), a reptile who enjoys life in Florida's urban and suburban areas as well as natural habitats. His maximum length is 5 inches, head to tail, and he changes color according to the time of day. During the day he's dark gray-brown, and he takes on a translucent flesh-white color during nighttime hours. Some may have dark or light spots, particularly on the tail. The belly has a yellowish color and under the tail he's orange, unlike other Florida geckos. What Kind of Hummingbirds Live in Washington State? What Kinds of Lizards Live in California? What Kind of Octopus Live in the Atlantic Ocean? What Bird Chirps in the Middle of the Night? What Do Marbled Geckos Eat? What Kind of Bluebirds Are in Tennessee?